The instruments of the standard Filipino rondalla have similarities in structure and are played with a plectrum made out of turtle shell. Except for the guitar and bass guitar(double bass), all are 14-stringed consisting of six(6) sets of strings tuned in the intervals of fourths, each set consisting of 1, 2 or 3 string/s. The purpose of the doubling or tripling of strings is to produce better sound and increase tone volume. 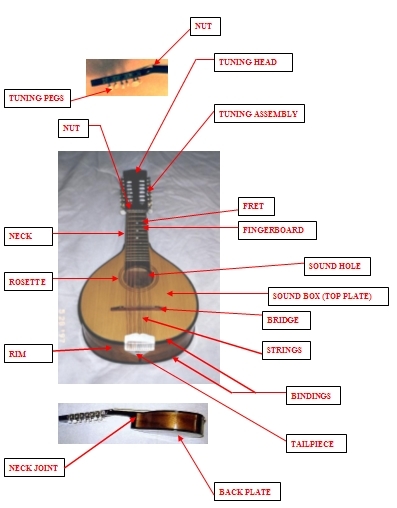 The main parts of the stringed instruments of the rondalla are basically the same. A hollow body(sound box) constructed of a sound board(top plate), which is attached to a back board(back plate) by side walls(rims) form the main body of the instrument. The sound board picks up and amplifies the vibrations of the strings. The nice-figured body(sound box) is attached to one end of a narrow neck against which the strings can be shortened by pressing the fingers on the fingerboard to vary the vibrating length and thus the pitch. The neck ends in the tuning head which has the worm and gear mechanism to adjust the tension of the strings when tuning the instrument. There is a string holder(tailpiece) at the bottom of the body and a bridge on which the strings are stretched, so that they can vibrate freely. The sound holes with a round shape, except the laud which is f-shape, have a great influence on the timbre of the instrument. Basically, they communicate the volume of air inside the instrument with the outside air which is the medium in which the waves are carried from the instrument. The size and openness of the holes influences the frequency of the vibrating mass of air within the instrument and therefore the selective reinforcement of certain notes. The holes also influence the flexibility of the soundboard and consequently affect its vibrational patterns. Tops, backs, and sides are carefully selected and graduated to enhance their natural attributes. Every piece of wood from the neck to the smallest brace is acoustically matched to obtain the highest performance from each instrument. The wood of langka, kamagong, narra, ballatinao, tanguile, and Philippine mahogany were generally used as materials for the construction of the instrument. Although the imported pine wood and rosewood continued to be used by some. In an 8-member rondalla, it is advisable to have 4 bandurrias, 1 laud, 1 octavina, 1 guitar, and 1 double bass. The 30-member group has 16 bandurrias, 3 piccolos, 3 lauds, 3 octavinas, 3 guitars, and 2 basses.The number of percussion instruments in both small and large combination is optional. In the modern version, these instruments can portray the corresponding tones of orchestral instruments. The bandurria does the role of the first violin, the clarinet, the flute, and the trumpet. Its lowest note is small F# while its highest is three-line G. The laud, which is at times interchanged with the octavina, performs the role of the viola, the cello, the bassoon, the horn, or the trombone in the orchestra. Its range extends from great F# to two-line G. The octavina carries the same range as the laud. The guitar furnishes the chores and the contra-bass. It is notated an octave higher than its actual sound. Its range extends from great E to three-line E. The bass-guitar supplies the base in the harmony in the same manner as the the contra-bass does in the orchestra. Like the guitar, the bass-guitar is notated an octave higher than its real sound which is from contra-E to small A. 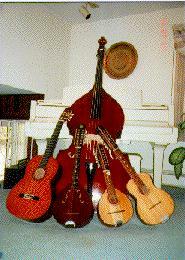 Other instruments in the string and percussion sections are added when the rondalla must assume a symphonic stature. In this case the number of players increase proportionately doubling or tripling the number of original and authentic instruments of the group. The bass drum, snare drum, cymbal, triangle, tambourine, marimba, timpani and kettle may be added for the rhythmic effects. The UPA&F Rondalla uses the maracas in one of their musical rendition. Maracas are gourd or gourd-shaped rattles filled with seeds or pebbles and used often in pairs as a rhythmic instrument.